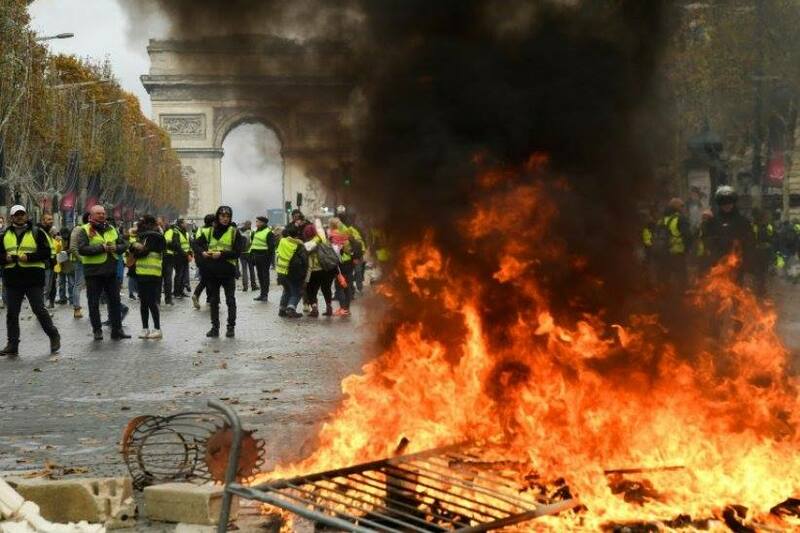 Barricades in fire on the Champs Elysées, luxury cars of set ablaze, luxury shops wrecked and looted, “the most beautiful avenue of the world” was burning from our desire to live and not survive anymore. “The City of Light” was much lighter than its masters ever wanted. And the fires of revolt have been burning since three weeks also in other places – in France and also in Belgium – warming up our hearts and minds. Haven’t we just found a cure for the burn out at work? For the autumn blues? For this feeling that our lives are fading out wasted at work for a lousy pay or at school to become another unemployed? That we will never live anything else than this misery of life under the dictatorship of money? These are the most important points that aroused our hope that all this is not a fatality, that a radical change of the society is possible. •	The movement has developed outside and in some sort also against traditional structures (parties, trade unions, media…) that capitalism equipped itself with in order to make any practical critique inoffensive. •	So far there were no “positive” demands, no speakers, no spokespersons, no negotiators, or they represented only a tiny (and sometimes not very appreciated, or even threatened by the most radicals) minority of the movement. Even if the media try to enclose the demonstrators in the framework of “struggle against taxes”, the universal motto is rather “fight against the poverty in general” in all its complexity (low wages, high prices, wasting our lives at work, alienation…) and therefore, in final consequences, it puts into question the capitalist order as such. •	The movement is organized regionally and it is overcoming the usual trade-unionists’ divisions according to production branches. It’s neighbors, friends or colleagues that meet each other on the blockades or barricades and what they have in common is not a particular interest of this or that professional branch but a general fed up with the misery of our lives that is implicitly shared by all the working class. Attempts to restructure the movement so that it fits into the framework of capitalist structures of course exist – callings for making “clear and positive demands”, discussing with authorities, staying reasonable… But so far they didn’t have a lot of success. On the contrary the movement is not afraid to show to the so called moderates that this is no way, that they won’t give up their radicalism and that they will not let do those who want to divide the movement on this axe in order to destroy it. •	The movement, or its big part, is radical and therefore violent and it assumes it. It is not only that the “Gilets Jaunes” are not afraid of confrontation with police, many are not afraid to break, to burn, to root out; they have no respect for private property, they loot… But more important, they also claim it – some implicitly others openly, what makes the usual tactics of the bourgeoisie to divide the movement in “good demonstrators” and “bad vandals” difficult to use. Not everybody feels like to participate to the riots, but many consider the riot as a legitimate expression of the movement. •	Not only that the movement doesn’t stop to appeal the rest of the working class to join it and it is trying to spread and generalize (the protests develop in the “lycéen” sector). More and more callings for fraternization with repressive forces appear as well. There are people who reply to the CRS (antiriot police) complaining about their hard work that they can simply put down their guns and join the demonstrators. There are those who invite them to think about who is their real enemy. And there are others who call the soldiers to disobey to their masters in a case they would be deployed against the movement. •	Nothing is sacred for the movement, no symbols, no legends, no identity, no ideology that could not be burnt down, destroyed, rooted out. The best example from last weekend – the Arc de Triumph, the symbol of their bourgeois republic and its warlike omnipotence, was tagged, its museum ransacked and proletarians were dancing of joy on its roof. These are the points to be developed and overcome in the continuing struggle. Let’s struggle together to avoid any recuperation of the movement by political parties or trade unions, let’s fight together against the frameworks of elections, reforms and demands that some would like to impose on us.